Description: This functional and beautiful piece was custom designed and built for a couple living in Del Mar. They wanted a chest to store throw pillows and blankets in their guest bedroom and function as a back board for a queen size bed. The bed is sculptured metal in the form of tree limbs and coated in dark brown to look like natural tree branches. With direction and input from my clients, I designed a beautiful and functional chest that complimented the artistically crafted bed. 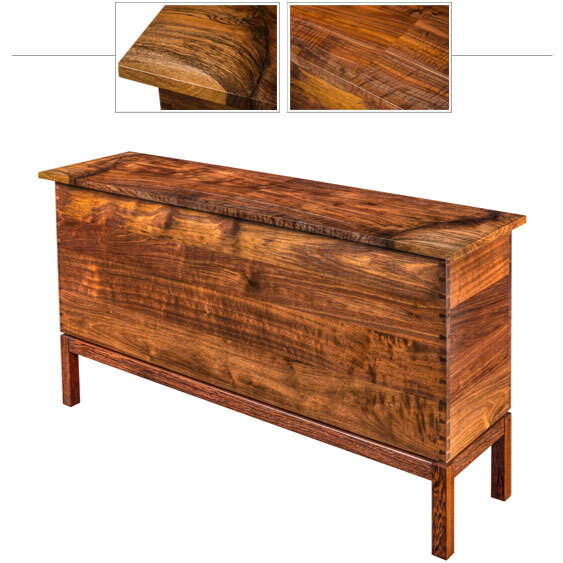 The chest is crafted from Peruvian Walnut and the bottom from unfinished, aromatic cedar. The top is made from an unusual, book matched pair of Claro Walnut slabs with sensational color and highly figured wood grain. The ends of the top have a wing like appearance from English Walnut grafts when the tree was young, to produce high quality walnuts. The chest appears to be floating over the beautiful Wenge base. The craftsmanship is exceptional with beautiful and sturdy joinery, torsion hinges to hold the chest lid in any position and a satin smooth finish. Sold A similar piece can be designed and fabricated as desired.